GoldKey Security Corporation has released GoldKey Tokens with Built-In Flash, a line of form factor authentication tokens that come with a hardware-encrypted secure flash drive along with a smart card and two-factor authentication. The new device measures about an inch long and is made of a stainless steel case with an industrial grade waterproof epoxy that seals the circuitry and deters tampering. The flash drive contains 64GB of hardened storage. 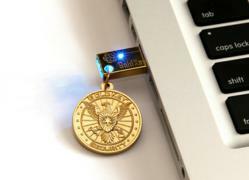 When connected to a USB port, the GoldKey with Flash displays a read-only partition that allows the encrypted drive to be unlocked. Once open, it functions as a regular flash drive. When removed, the data is once again locked. The token is equipped with GoldKey’s patent-pending encryption key management technology that allows each token to be registered to a Master Token for PIN resetting. The tokens also support Gold-ID two-factor authentication which doesn’t need OTPs or certificates for operability. This token has passed the FBI’s vetting process for Advanced Authentication as part of the CJIS Security Policy compliance strategy for public safety units and law enforcement departments. It’s available in 8, 16, 32 and 64GB sizes and supports Windows 7 and Mac OS X Lion.